Here are the local election results as of 5:00 p.m., Tuesday, November 22, 2016. 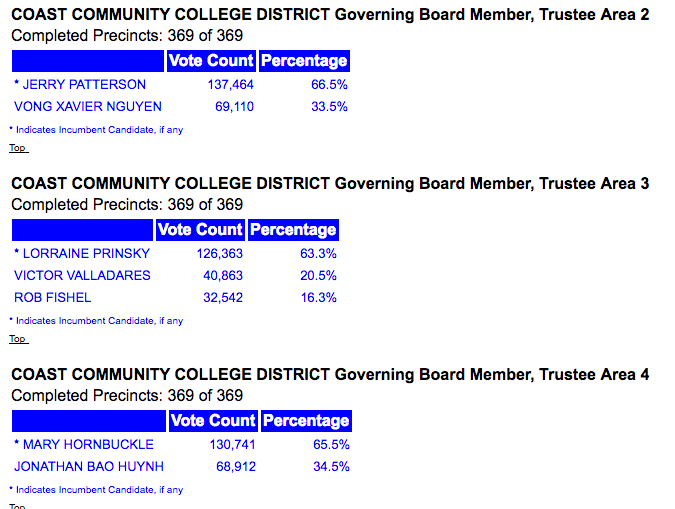 You can read the full Orange County results HERE. The next update will be tomorrow, Wednesday, November 23, 2016 after 5:00 p.m. There will be no counting done on Thanksgiving Day nor on Friday following. There remain 61,649 votes left to count. Sandy Genis still leads John Stephens by 228 votes. Stephens leads Allan Mansoor by 2,524 votes. 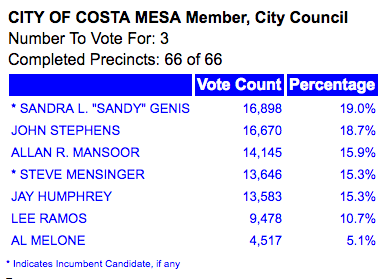 Mansoor leads Mayor Steve Mensinger by 499 votes. Mensinger leads Jay Humphrey by 63 votes. Lee Ramos and Al Melone trail the field. 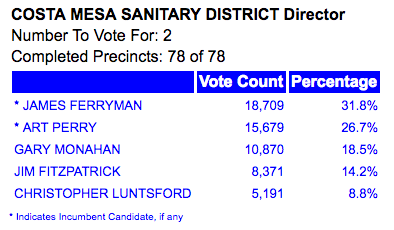 Jim Ferryman and Art Perry continue to hold solid leads over all challengers. Perry leads Gary Monahan by 4,839 votes. Jim Fitzpatrick trails Monahan by 2,499. Christopher Luntsford trails. Incumbent Jim Fisler still leads challenger Alex Reich by 1,507 votes. The citizen-generated Measure Y - the Smart Growth Initiative - is passing by more than a 2-1 margin. Measure Z, the City-generated measure designed to confuse voters is also passing, but trails Measure Y by more than 5,000 votes. The citizen-generated Measure AA, designed to protect Fairview Park, is passing by more than a 2-1 margin. The City-generated Measure BB, designed to confuse the voters is failing. Both citizen-generated medical marijuana initiatives are failing badly. Measure X, the City-generated measure to theoretically compete with them is passing. The vote-by-district measure that was hijacked by Mayor Pro Tem Jim Righeimer to create 6 voting districts AND add a directly-elected mayor is passing handily. This bogus, meaningless measure put on the ballot by the Mesa Water board to snooker the voters into thinking favorably about consolidation of Mesa Water and the CMSD is passing. 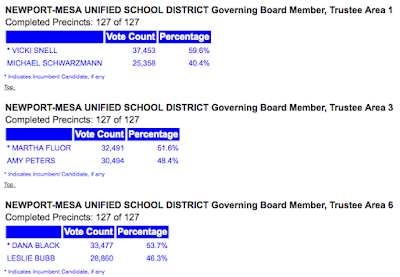 All incumbents in these races are holding their seats by solid margins. 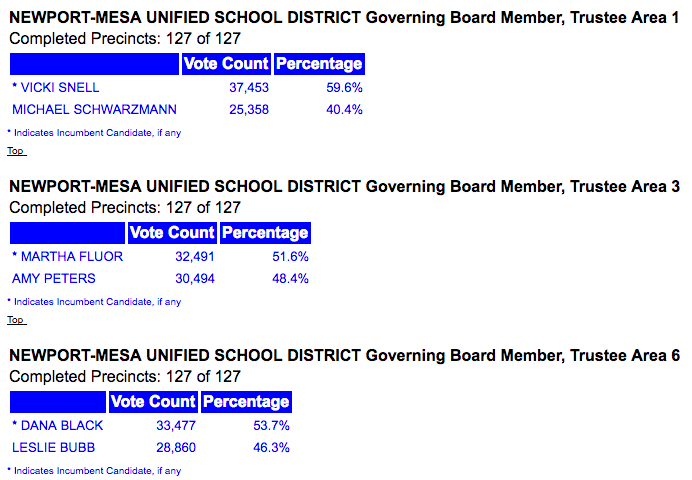 All NMUSD incumbents are holding solid leads for their seats. 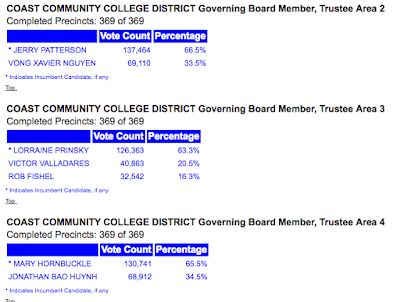 So, we have just over 61,000 Orange County votes left to count. This is the heavy slogging part of this process. There will be results posted tomorrow, then Neal Kelley and his band of merry minions will take a couple days off. We're told they will be counting the weekend after the Thanksgiving holiday. Good for them... and for us.